Hello and welcome to the November 2009 Immigration Newsletter! A hearty welcome back to our regular readers and our new readers. The Thanksgiving Day marks the beginning of the traditional Christmas shopping season in the U.S. With the onset of fall and the approach of winter it’s been getting quite chilly in the U.S., however, people are heartily enjoying the weather and change of seasons. The happiness is doubled as we see signs of the economy moving back to normal. The hot immigration news this month once again involves the H-1B visa program. After months of slow movement H-1B usage surged in October and early November. According to the latest figures from the U.S. Citizenship and Immigration Services (USCIS) for Fiscal Year (FY) 2010 the pool of 20,000 H-1B numbers for holders of U.S. advanced degrees has now been exhausted. USCIS will continue to accept H-1B petitions for employment in FY 2010, however, any petition that is filed on behalf of a foreign national with a U.S. advanced degree will now be counted against the standard H-1B cap. As of November 20, 2009 the USCIS has advised that 55,600 petitions had been filed against the 2010 cap. This is a jump of 1,800 visa application in just two weeks, and 7,800 since September 25. The surge can be attributed to the improving economy and the upcoming December graduation season. Though filing rates were sluggish earlier this year, this recent uptick suggests that demand for H-1B workers is increasing. This means that remaining FY 2010 cap numbers could disappear more quickly than previous usage indicated. It also means that there could be more competition for FY 2011 cap numbers when next year’s filing season opens on April 1, 2010. Now on to some other interesting news… Let’s continue with our voyage of knowledge and wisdom with one of the most pleasant announcements of the year. Guess??? No, I’m not talking about the H-1B visa (we already hit that topic). I’m talking about President Obama’s decision to end America’s 22-year HIV ban. President Barack Obama’s administration published a final rule on November 2, 2009, that will end the U.S. ban on HIV-positive foreign visitors and immigrants. The change will take effect in January 2010. The President announced on October 30, 2009, the elimination of the HIV entry ban. Since 1987, HIV-positive travelers and immigrants have been banned from entering or traveling through the United States without a special waiver. In July 2008, Congress removed all legislative barriers to repealing the ban and paved the way for HHS to repeal the ban. “Twenty-two years ago, in a decision rooted in fear rather than fact, the United States instituted a travel ban on entry into the country for people living with HIV/AIDS,” Obama said, announcing the new policy on October 30. Effective January 2010, non-U.S. citizens who are HIV positive will be able to enter the U.S. just like any other person does. This is a major step in ending the stigma associated with HIV and we heartily congratulate President for taking such a bold step to keep the unity and humanity alive in the world. Sometime this year, President Obama will press Congress to approve his national health insurance plan. Obama’s plan, perhaps best described in Jacob Hacker’s “Health Care for America” plan has the ambitious and expensive goal of providing affordable health insurance to all Americans through a combination of a new federal “Medicare-like” program and existing employer-provided health plans. 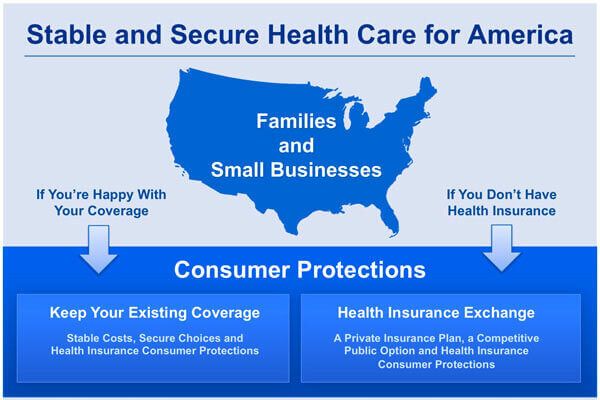 We still don’t know what the final health insurance plan will look like, but the image below may give you some idea on the Obama administration’s idea of the Health Care for America plan. requiring that Americans who remain without insurance either purchase private coverage or buy into the Health Care for America Plan. For persons already covered by employer-provided health insurance, Health Care for America would virtually eliminate the suddenly very real threat of losing coverage because of layoffs. USCIS has observed a rapid increase in the H-1B filings as 1600 H-1B petitions were received in just one week. As of November 20, 2009, USCIS has received approximately 56,900 H-1B cap-subject petitions. The rapid increase in the H-1B filings indicates that H-1Bs for FY2010 will go off soon. USCIS, on November 5, 2009, announced that it will temporarily accept H-1B petitions filed without Labor Condition Applications that have been certified by the Department of Labor. USCIS has issued Q&A on the recent revisions to Form I-693, Report of Medical Examination and Vaccination Record, and changes to the tuberculosis testing requirement for adjustment of status applicants. Now for the regulars – this month’s Immigration Article throws a light on Fiancée Visa Processing in East Asian Countries. Also check out our In Focus section for this month, entitled ‘U.S. Travel Tips – 7 Tips for Travelers to the U.S. for a Safe Journey,’ which will help the travelers to the U.S. to be prepared for a safe journey and a secure stay in the U.S.
Every month we introduce a new and interesting question for our opinion poll. Last month’s poll results indicate that 76.92% of the respondents believe that the Recovery Act has made significant progress. We appreciate that people take interest in the opinion question and cast their vote to give us their feedback. Keep it up! And continue to cast your vote to express Your Opinion. We congratulate Dominic Rattansey for winning last month’s Immigration Quiz. Again, we received a significant number of responses from our readers, who talked about various solutions to support their position, but Dominic Rattansey gave the correct answer and won free online consultation to discuss the concerned Immigration issues. So it’s time to get ready for this month’s quiz. If you know the correct answer your name might be featured in next month’s newsletter. All the Best!!! USCIS on November 9, 2009, announced that the previous version of the Notice of Entry of Appearance as Attorney or Representative (Form G-28) will be accepted until further notice. USCIS encourages attorneys and accredited representatives to use the new Form G-28; however, USCIS will not reject filings of the previous Form G-28 version until further notice. The Department of State (DOS) has released the Visa Bulletin for December 2009. The cut-off dates for employment-based preference categories remain unchanged except a slight advancement by 8 days for India under EB-3 category. Travelers to the U.S. get so excited by the thought of going to the U.S. that they fail to undertake the basic precautions for a safe journey to the U.S. and ultimately they land in trouble. In this article, we discuss 7 travel tips which will help the travelers to the U.S. to be prepared for a safe journey and a secure stay in the U.S. Read the article ‘U.S. Travel Tips – 7 Tips for Travelers to the U.S. for a Safe Journey’ to learn what are the things the travelers to the U.S. should take care and what are the things they should avoid to ascertain a safe journey to the U.S. Many Consular Posts implement and follow varied visa application procedures and policies depending on the local conditions and requirements. In this article we attempt to cover K-1 visa processing procedures followed by Consular Posts in East Asian countries like China, Korea, Philippines, Thailand and Vietnam. The information below will help foreign national fiancés from these countries be better prepared for the K-1 visa interview. Is the E-3 with personal trainer/nutritionist as my specialty occupation the best way to go, given my degree and experience? (And is it likely to work?) Is it correct that the H-1B has the same criteria for approval as the E-3, but the E-3 has better quotas for Australians? 3. The company must agree to pay you at least prevailing wage or higher for that type of position in that geographic area. The prevailing wage can be determined from the U.S. Department of Labor’s (DOL) website. The website has four levels for the prevailing wage: Level 1 is entry level requiring no experience; Level 2 requires some experience; Level 3 requires significant experience; and Level 4 requires additional experience that involves supervisory duties. Since you want the prevailing wage to be as lower as possible, you will be coming in at the entry level, Level 1. The LCA is filed and approved electronically. You do not need prior approval from the USCIS, you can file directly with the US consulate in Sydney (Australia). In order to get a visa at a US consulate you have to make an appointment for an interview. You need to have a completed nonimmigrant E-3 visa application form, a certified LCA, and required supporting documentation. The supporting documentation includes a letter from your employer describing the employer, the position you have been offered, your qualification and the terms of employment, your original credentials, transcripts and academic certificates, and your passport. The E-3 visa is a multiple entry visa which allows you to remain in the US for up to 2 years. You can travel outside US during this period. The E-3 visa is an employer specific visa, i.e., you can only work for the sponsoring employer unless you get prior approval from the USCIS to change employers. However, you are certainly allowed to take ongoing education and career development courses on part time basis as long as the primary purpose of entering the U.S. is to work. In Nov 2004, my sister (US Citizen) filed an I-130 petition. I would like to know how I can expedite issuance of my Resident Visa. When one may apply and receive an immigrant visa (green card) is controlled by a “priority date” system which essentially allows those who applied first to obtain their green cards before those who applied later to receive theirs. Currently most preference based immigrant visa categories have backlogs, i.e., more people have applied then there are visas for setting up a waiting period. In these categories you must wait until your priority date becomes current before you can apply for your visa. You fall into what is known as the Family-based “Fourth Preference” category, namely, brothers and sisters of U.S. citizens. The priority date for this category is October 22, 1985. This means that only those individuals whose U.S. citizen brother or sister filed a petition for them on or before October 22, 1995 may now apply for their green cards. Beneficiaries of petitions filed after that date must wait until their priority date (the date their petition was filed) is current before they can apply for their green cards, which essentially means you may have to wait another 10 years from the date your sister filed the petition before you may be eligible to apply for the green card.